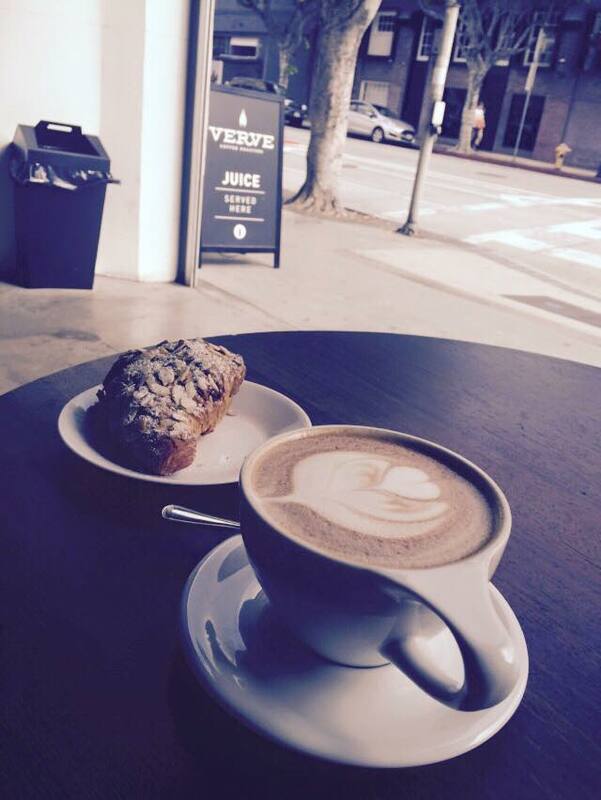 Coffeeneuring the Third: Verve in Downtown L.A./CicLAvia – WeLove2Bike! 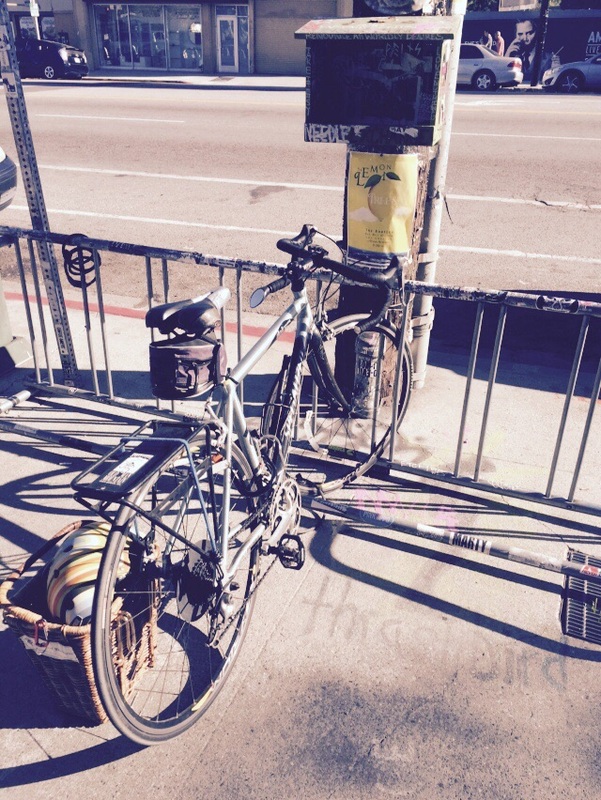 Bike-friendliness: Bike rack right in front of sidewalk adjacent tables, and visible from indoor seating areas. Not enough racks for all the bikes there that day, but many were simply parking their bikes at the sidewalk tables. 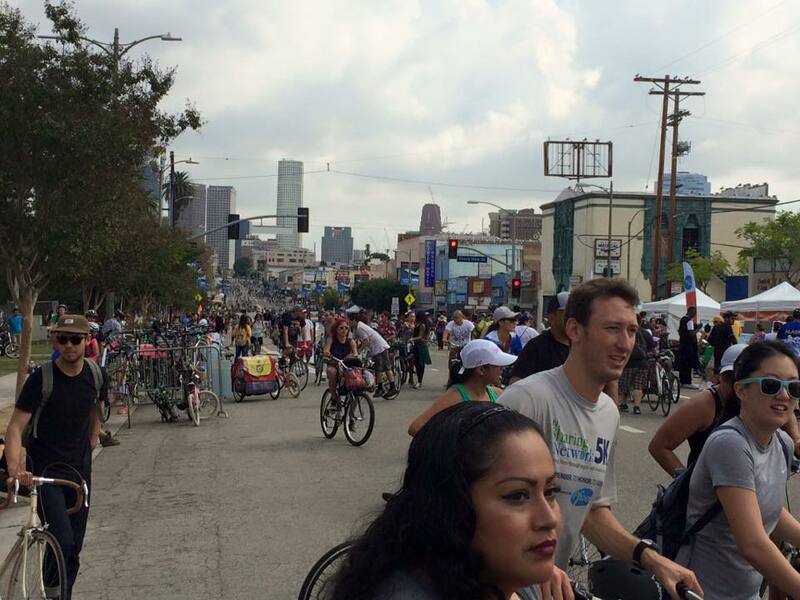 This trip coincided with CicLAvia, an open streets event L.A. has 3-4 times a year, each time featuring a different part of the Los Angeles area. 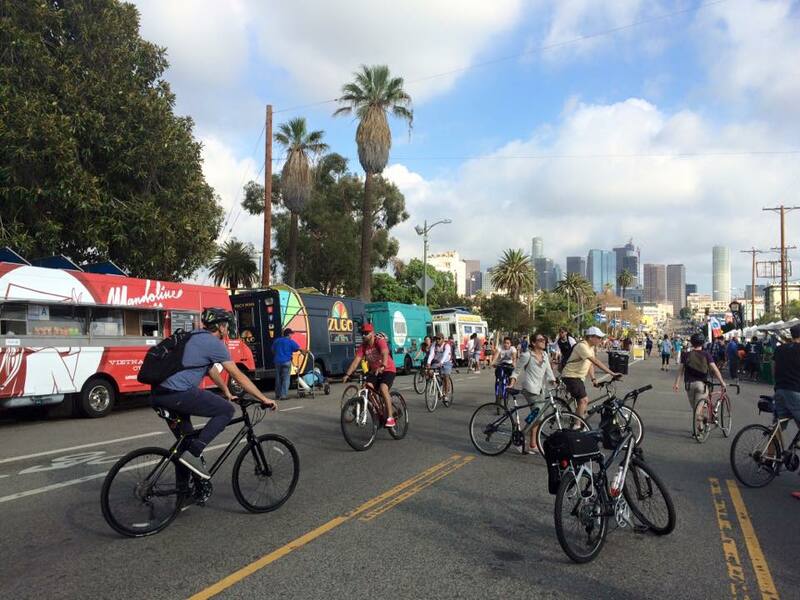 From 9 am to 4 pm, several miles of streets are closed to cars, and open to bicyclists, pedestrians, skateboarders, strollers, and other non-motorized conveyances. This particular one was celebrating the 5th anniversary of the very first CicLAvia (held on 10/10/10), and so featured the “Heart of L.A.” route, extending from downtown in three directions. I started at the MacArthur Park leg. But first I attended the Sunday morning service at my church, First Unitarian Church of Los Angeles, which happens to be in the MacArthur Park area. 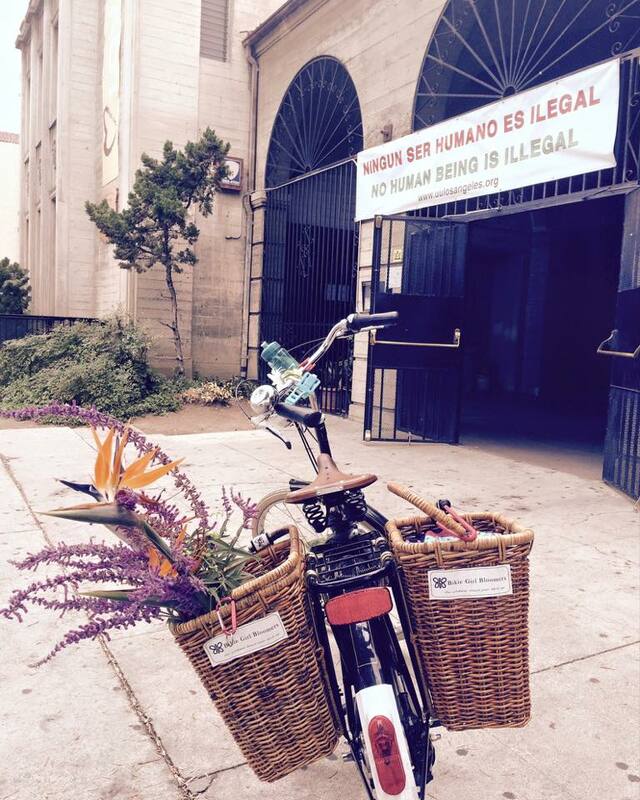 This pic shows the banner out front that proclaims, in both Spanish and English, that no human being is illegal. 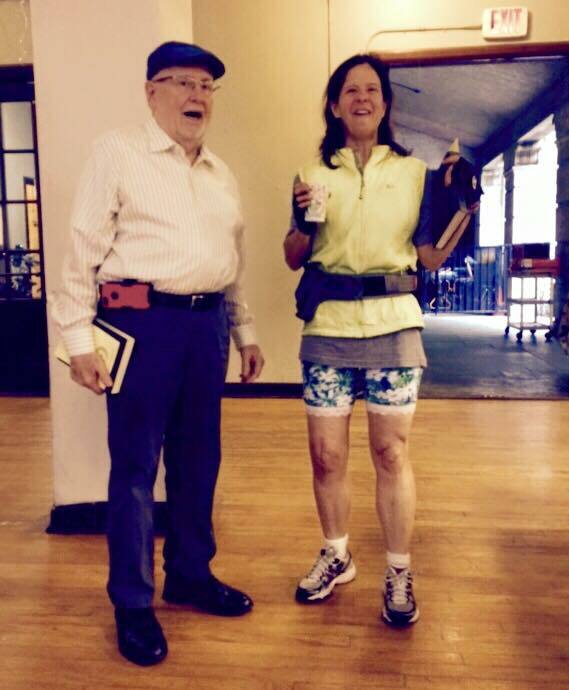 I was delighted to see my friend Alice had come to church ready for CicLAvia, wearing her Crazy Daisy Bloomers! 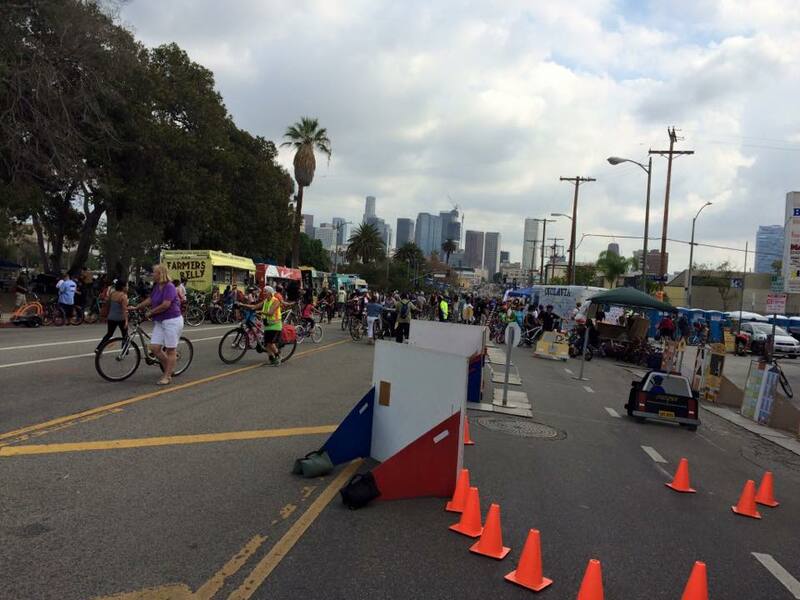 In the foreground, you can see the bike rodeo set up for little kids in the street adjacent to MacArthur Park. The downtown skyscrapers are visible in the distance. 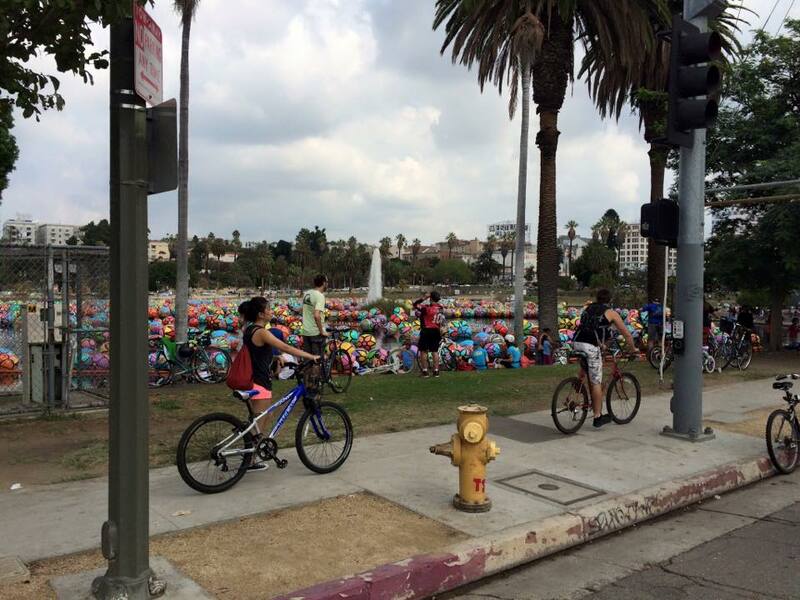 The lake at MacArthur Park is the site of a public & civic art project called that features colorful spheres floating. You can see the fountain shooting up in the center of the lake. 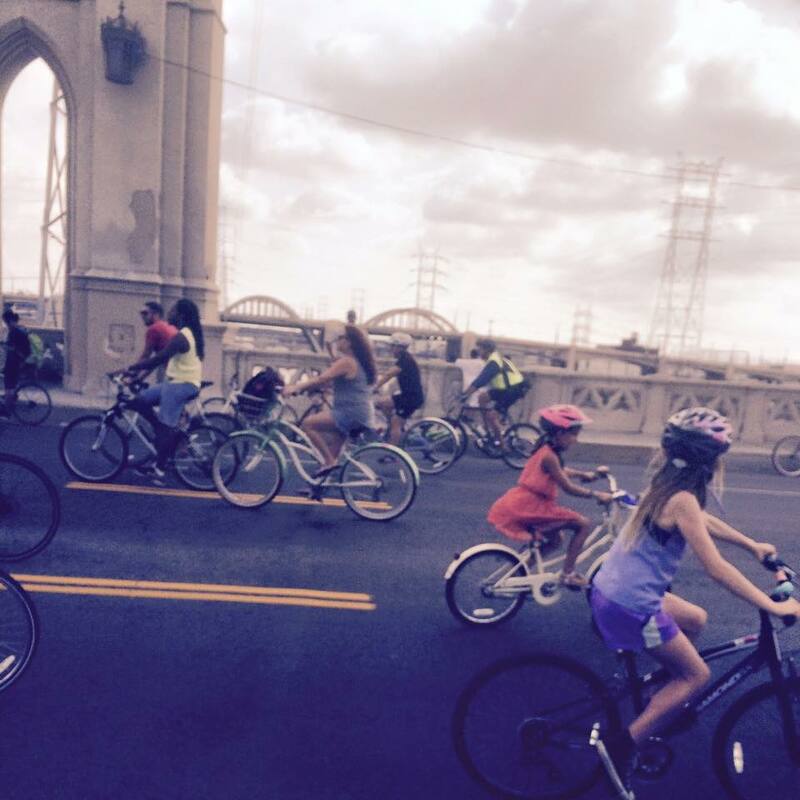 CicLAvia attracts thousands of Angelenos, mostly on bikes, so I had plenty of company for my ride. 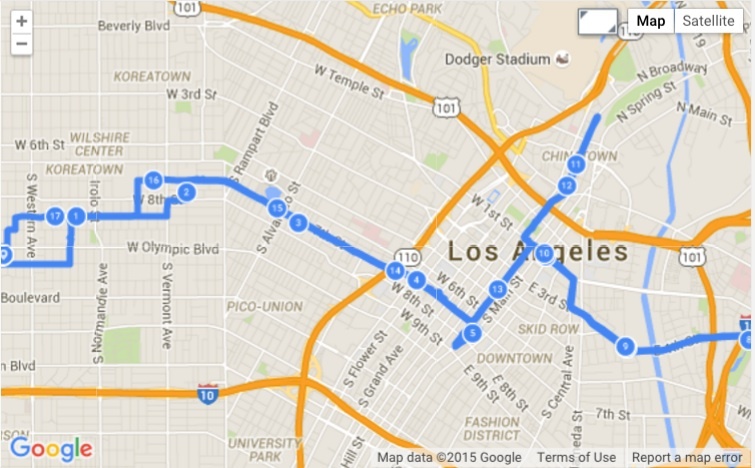 Getting to Verve required a very short detour from the CicLAvia route. 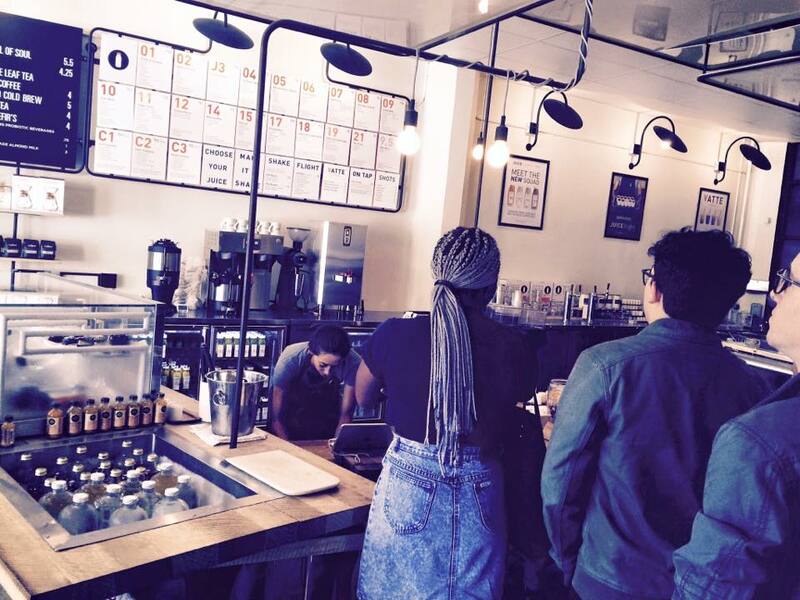 I headed south a couple of blocks on Spring Street so I could explore this Santa Cruz based coffee shop that is featured on lists of best coffee shops in L.A. After waiting in line, I placed my order with the too-hip-for-newcomers barista, and checked out the laptop crowd seated inside. 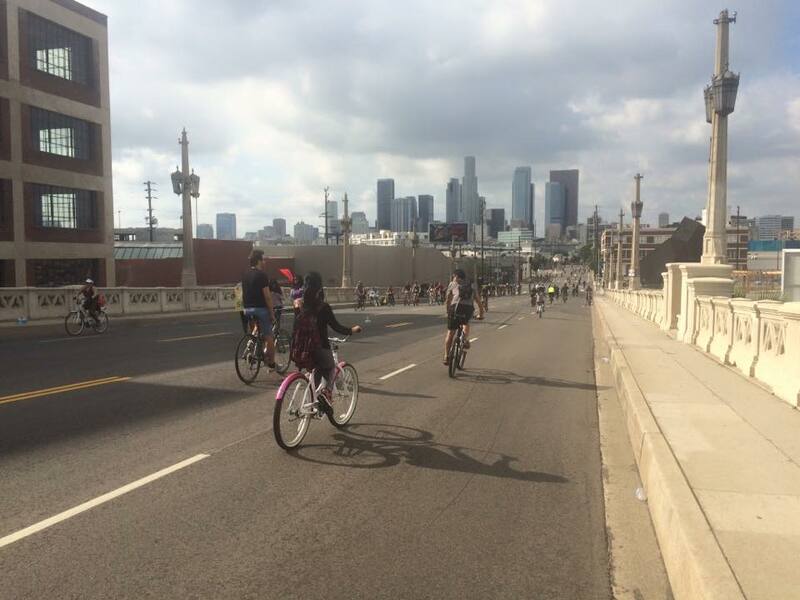 I then got back on my bike, and explored the rest of the CicLAvia route. 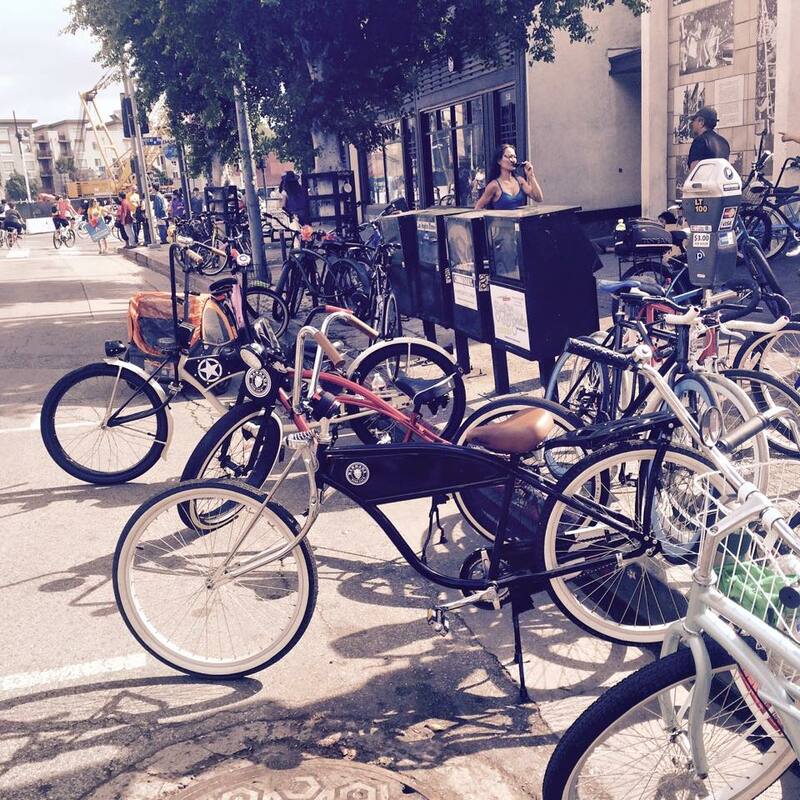 After passing by City Hall, I headed into Little Tokyo, where I noticed an impressive group of cruisers had parked. 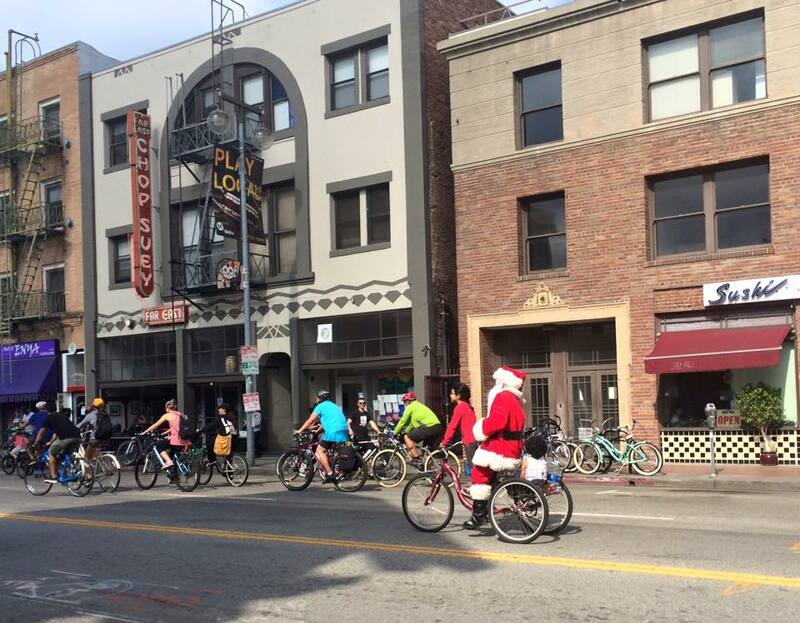 When I stopped to snap that photo, along came Santa Claus. 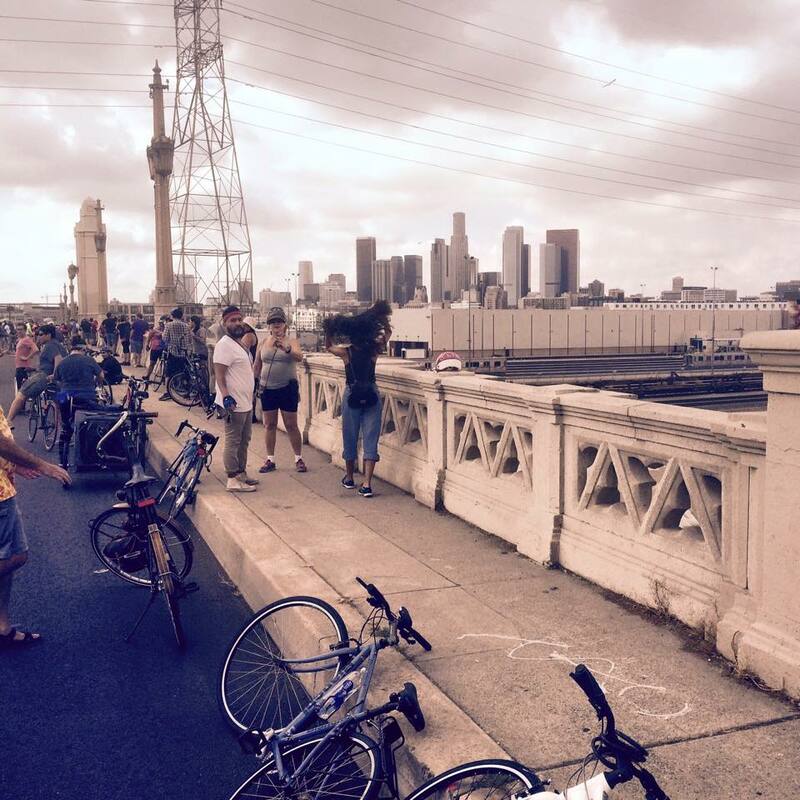 The route then continued over the 4th street bridge, a popular photo op, and into Boyle Heights. 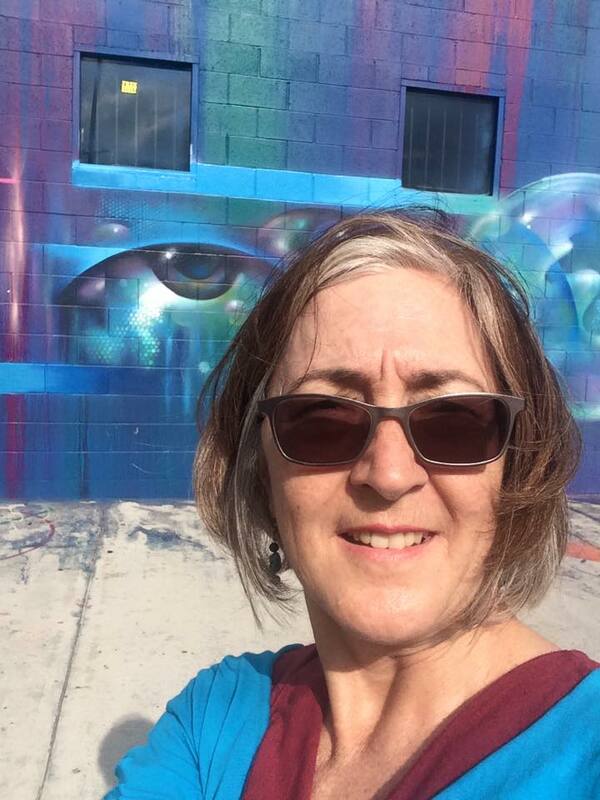 There are so many beautiful murals in the Arts District, I had to nab a selfie at one of my favs. 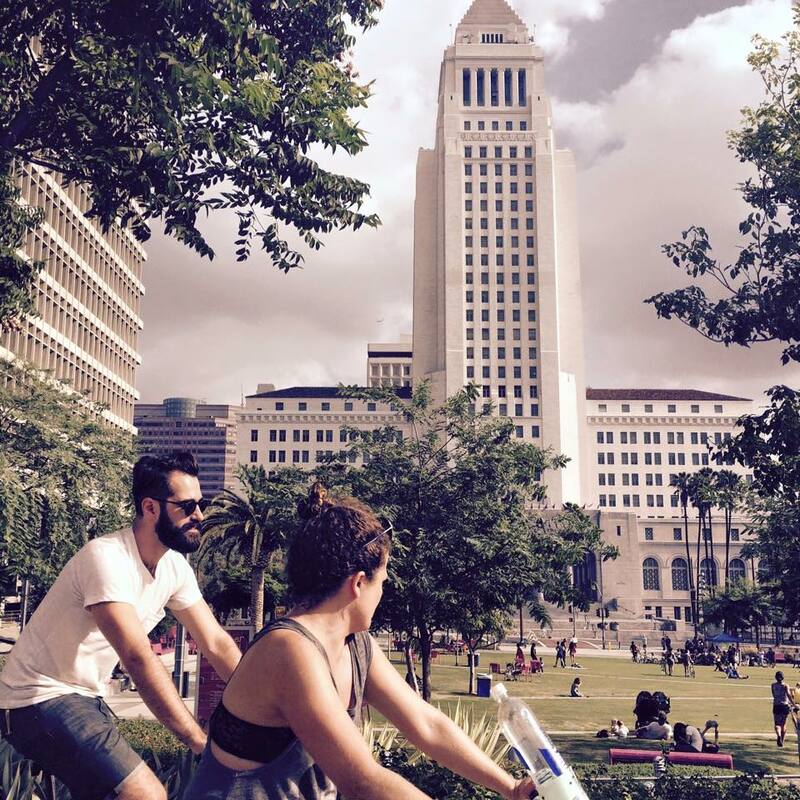 I then passed by City Hall and Grand Park. 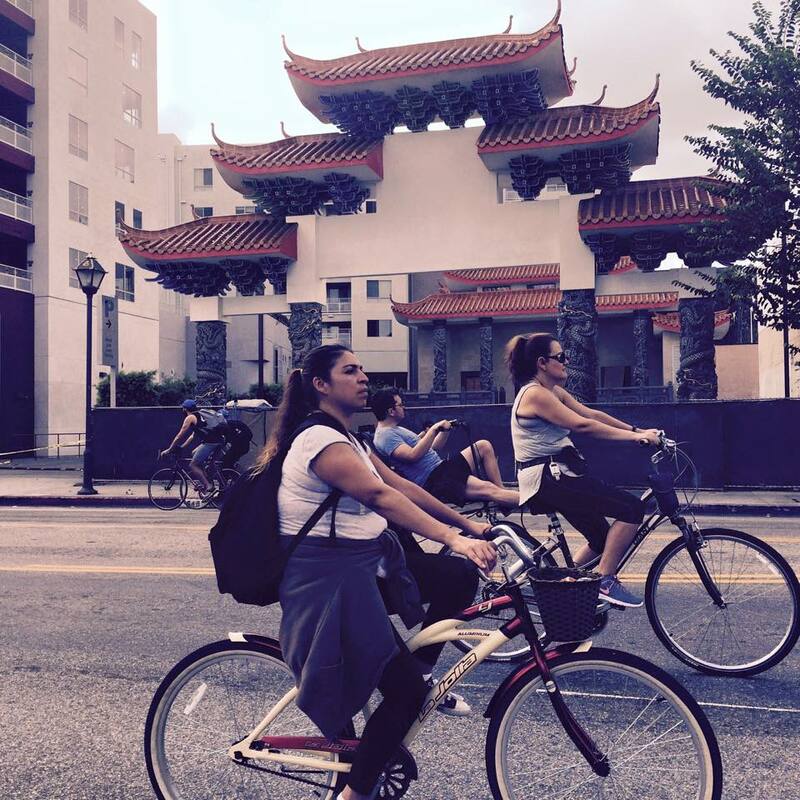 The third and final leg of the route went into Chinatown. 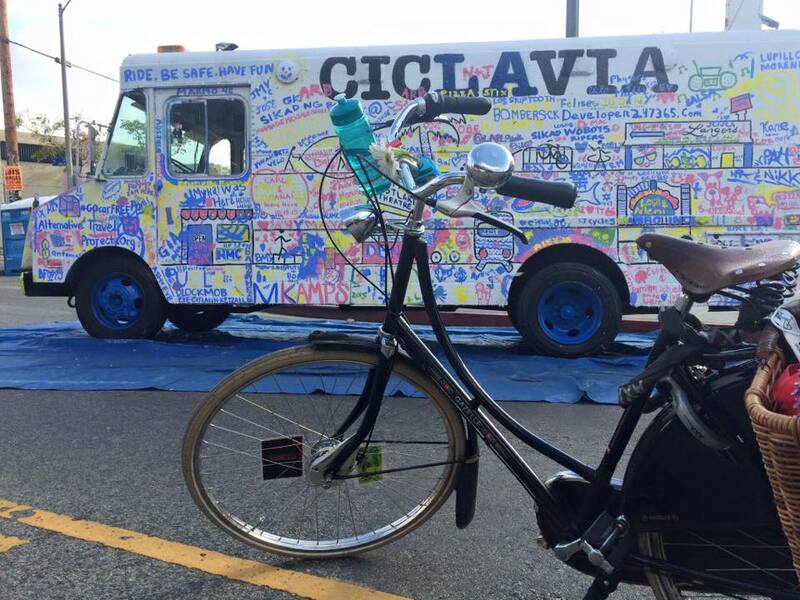 I ended my experience of the CicLAvia route back at the MacArthur Park hub. By this time, the graffiti truck (which makes an appearance at each event) had been rather thoroughly covered. 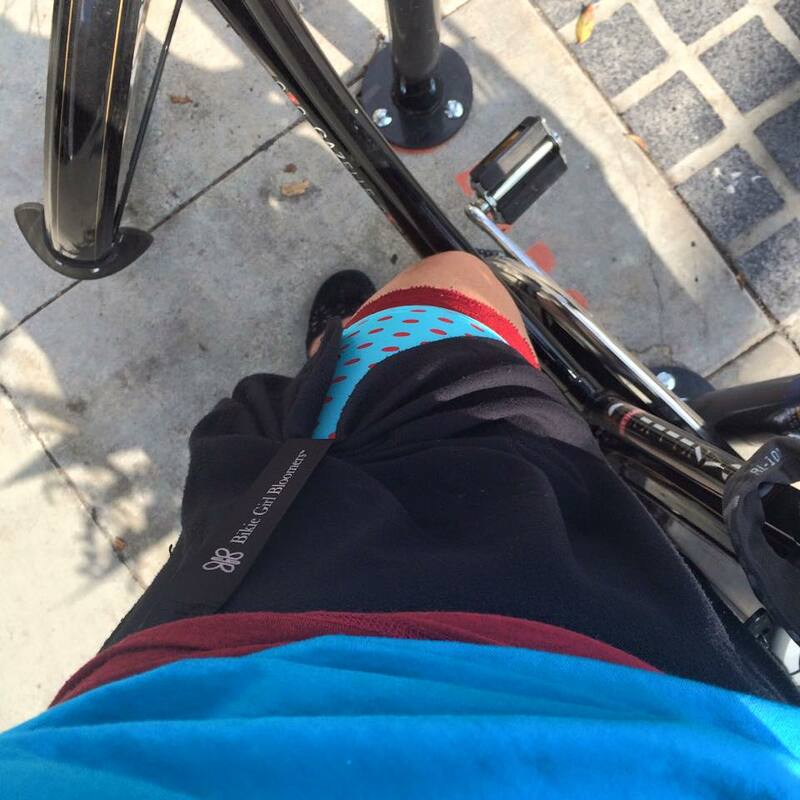 Pingback: Coffeeneuring 2015: The Recap | WeLove2Bike!